Es ist soweit: Ein wunderbares und ausführliches Review zu unserem Prog-Epic „Place Called Home“ und dem dazugehörigen Webprojekt samt neuem YouTube-Video ist auf der Blogseite des Messeveranstalters photo+adventure erschienen. The J Conspiracy proudly announces : A wonderful and detailed review of our prog Epic “ Place Called Home “ and the associated webproject including the new YouTube video appeared on the blog page of the organizer photo + adventure. See translation below German text. 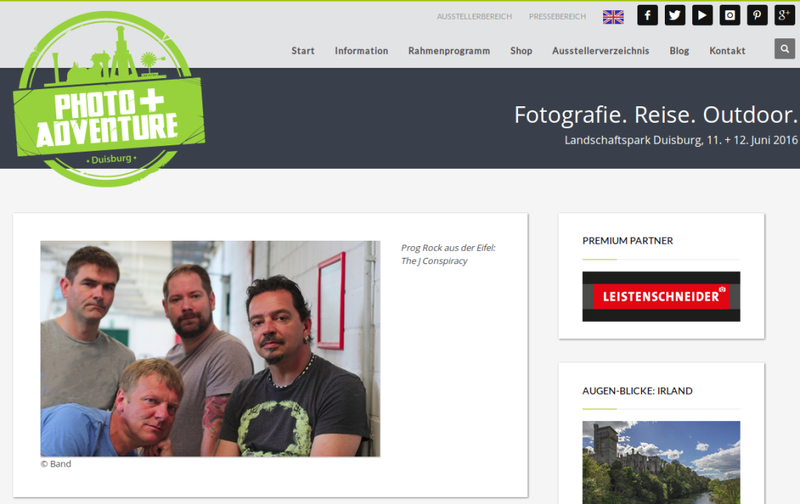 Place Called Home – oder: Unser Fotowettbewerb rockt! Place Called Home – or our photo contest rocks! Our photo contest 2016 goes into the hot phase – The deadline for submitting your photos on „Adventure“ is March 31. But today I turn back time and again dedicate this contribution to our „home“ photo contest from the previous year and to the four conspirators Ralf Brand, Christoph Buss, Karl Schlesinger and Heiko Loeb. What has one to do with the other? Meanwhile a lot. If I tell now that the four conspirators actually are musicians whose band „The J Conspiracy“ is, you are likely but still not much smarter, right? Perhaps I should add that the progressive rockers from the Eifel have recently released their first work on YouTube and that this epic song is evocative titled „Place Called Home“. „Place Called Home“ – that is 19:36 minutes of purest Krautrock. And even if the clock probably must be turned back a little more than a year to land in the heyday of this music genre, so the conspirators have entirely overthrown fully in the development of the associated video to the possibilities of the present, a „MusicPhotoArtWebproject“ off the ground and her audience taken on board: Anyone who liked and still like, can contribute under the motto „Music meets photography“ his very own photographic interpretation of the word „home“. Through its website www.thejconspiracy.de the musicians continue to collect image contributions of their fans and put them together with the song as a full-screen photo slider into the net. The highlight: The slideshow presents itself on every page request new and randomly arranged. So the project never stops and is always exciting and inspiring. But a bit statistic does not harm: For the six-month anniversary of the „Place Called Home“ project of the song is now in full-length to be seen as a video clip, and indeed enriched by the 100 best pictures of the photo contest „home“ of the Photo+Adventure Duisburg 2015. We are curious how to proceed with the „Place called home“ project and look forward to the next song by The J Conspiracy. Dieser Eintrag wurde veröffentlicht in Video und verschlagwortet mit Kritik | review, Place Called Home, YouTube . Lesezeichen auf den Permanentlink. Das Beitragsbild „Allerheiligen“ auf der Blogseite stammt übrigens von Christian Wakolbinger, der mit dem Foto „Trainer übrigens auch den 1. Platz beim genannten Fotowettbewerb belegte. Mehr von Christians inspirierenden Fotos findet ihr auf seiner fotocommunity-Seite, die wir Konspiranten nur wärmstens empfehlen.